NEW YORK, Dec 2, 2011/ FW/ — Opening its first ever boutique in the United States, J.Estina chose The Shops in The Plaza for its location and thus immediately catching the eye of the New York fashionistas. 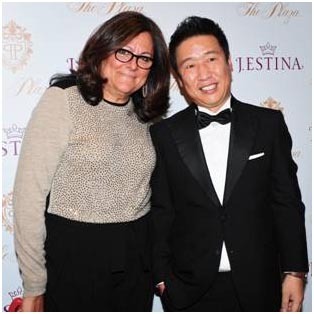 In celebration of the opening and collection launch, J.Estina held an in-store celebration hosted by renowned stylist MARY ALICE STEPHENSON on November 30, 2011 from 7-9pm. Downtown it-girl, MAY KWOK DJed the event. Some of the most important names in New York’s fashion and social set were present at the event including PATRICIA FIELD, FERN MALLIS, and SIMON COLLINS, Dean of Fashion Parsons The New School for Design. Survivor winner ETHAN ZOHN and MTV host LENAY DUNN were also in attendance alongside renowned models as JULIE HENDERSON, and ALLIE RIZZO. The event also brought out many of New York’s social elite including ANNIE CHURCHILL ALBERT, ANNA SHEFFIELD and RICHIE RICH. The store houses a large collection of its signature fashion jewelry and the E.S.Donna Collection, which is an intimate fine jewelry capsule. J.Estina has joined forces with The Plaza to present a limited edition, “The Plaza Exclusive Line.” The exquisite diamond necklace and earrings is festooned with diamonds to embody luxury.